sycamore fig-wood with colorfully painted scenes. Art experts like Samuel Merrin consider this ancient Egyptian sarcophagus to be among the last great ones in private hands. 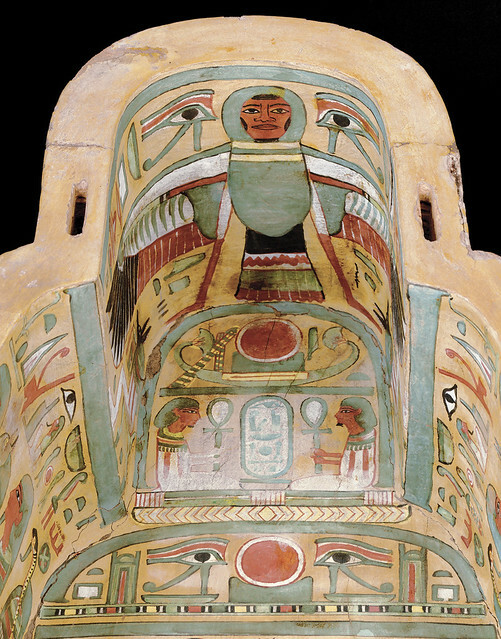 The front lid of Neshkons' sarcophagus is truly a marvel of ancient Egyptian art. Proudly acquired by the Merrin Gallery, it depicts the deceased in mummiform, surrounded by various goddesses, mystical creatures, and many other painted scenes commemorating Neshkons' life and wishing well for his afterlife. The right side of both the lid and trough of Neshkons' sarcophagus features varying scenes of ancient Egyptian funerary art with hyerogylphic inscriptions; further detailed on Sam's Flickr. 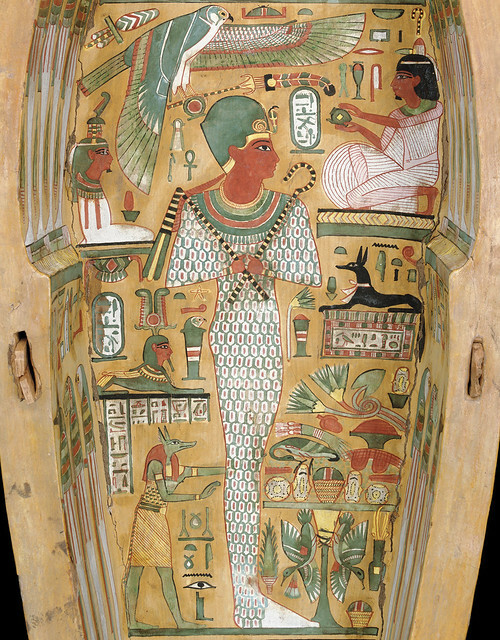 The Merrin Gallery's sarcophagus comprises of a lid, trough and the mummy of Neshkons. It was, and still is regarded as a record bid for a sarcophagus and mummy. 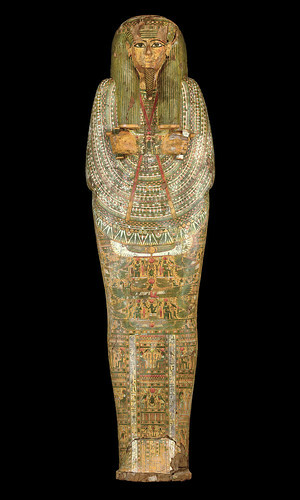 Burried sometime between 900–940 BC, the sarcophagus of Neshkons was excavated in 1900 AD and later shipped from the Egyptian Museum in Cairo to the Western Reserve Historical Society in Cleveland, Ohio, where the mummy was partially unwrapped. An x-ray image of the mummy shows us that a metal plate that was placed over an incision by which his internal organs were removed for ceremonial funerary purposes. 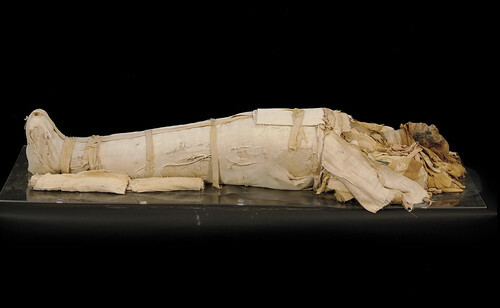 The x-ray of Neshkons' mummy, and analysis thereof, also helped determine that he died at 20 years of age. Mr. Merrin reminds us that, “It is one of the best sarcophagi from the best period — the 21st dynasty.” This is evident as the inside and outside of the sarcophagus display wonders of ancient Egyptian art. The inside walls of the Merrin sarcophagus are similar in that they depict the Four Sons of Horus and Anubis with various other deities. As far as typography is concerned, a passage known as the htp-di-nsw with additional scripture is featured on both inner sides, but with slight variations. The outer right and left sides are also found to have subtle, intended differences in terms of hieroglyphic scripture, scenes and depictions. 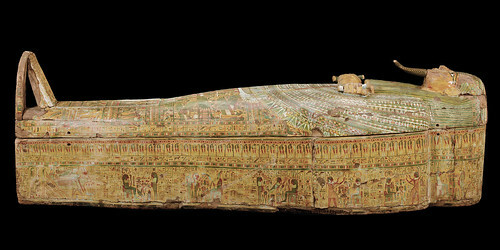 Speaking to Samuel we discover that, “Judging from the elaborate sarcophagus and the amulets founds under the wrappings, Neshkons must have been a man of high rank and repute.” His coffin is decorated with gods, goddesses and notable figures in ancient Egyptian society (e.g. Amenhotep I). Among the many other figures, the inside of Neshkons' sarcophagus features a small sphinx to the left of the central figure (Amenhotep I), below which is a standing Anubis. To the right of the Anubis is a table of offerings, and above that there is a small black figure — Anupet, the female Anubis. After Mr. Moshe Bronstein of the Merrin Gallery put down his auction paddle after the winning bid, another dealer was said to have exclaimed that it was a great purchase and asked to buy a half-share of the sarcophagus. “Buying a half-share is common among dealers, but we did not need to bring in any partners. We wanted to be the sole owners of this magnificent sarcophagus. We also knew that its provenance was perfect,” Samuel Merrin concludes. The inside-top part of the Merrin Gallery's sarcophagus features hieroglyphic inscriptions, seated jackal deities, as well as a Ba-bird, Anubis, and Ipt.